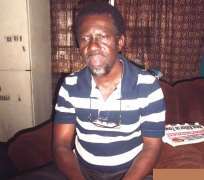 The health condition of top Nigerian actor, Kayode Dosunmu, better known as Pa Kasunmu, came into the public knowledge some weeks ago. Since the news first broke, there have been stories and counter stories that the Lagos State Government wanted to come to his rescue by providing the reported N12million medical surgery fee. Pa Kasunmu had reportedly requested the general public to raise the said amount to enable him get medical attention abroad. Even though Governor Babatunde Fashola was reported to have agreed to pay the amount, only about N3.5million was later donated by both the Lagos and Ogun State governments. Nollywoodgists.com was however, reliably informed by an insider that contrary to what the actor's family has been feeding the public with, he needs far less than N12million for the treatment. A source divulged to us that Pa Kasunmu's case isn't as bad as it was painted in the media. The source disclosed that the veteran actor does not need the amount quoted in the media for any surgery, but needs far less than that. It was learnt that his case doesn't need any medical surgery abroad, but just treatments in a standard hospital in Nigeria. These claims came up after the Lagos State government went deep to know the truth of the matter before redeeming its reported pledge to help the actor. The source also wondered why Pa Kasunmu's family would still be soliciting for funds when they've already had enough to cater for him. The insider blamed the actor's family for being selfish and turning Pa Kasunmu to a beggar all because of his condition. Reacting to the story, a representative of the actor, Mrs Olajide, who claimed to be the co-ordinator of the 'Save Pa Kasunmu Campaign,' told this reporter that nobody ever said the actor needed a surgery abroad. She disclosed that Pa Kasunmu was only advised to seek better medical treatment abroad by some people. On the N12 million requested for the veteran actor's treatment, Mrs Olajide explained that the treatment is long term and that it would come in different stages. She noted that part of the money will cater for relocating Pa Kasunmu from his present residence to a better one. “You need to see where he's living right now. Some suggested we get him a better accommodation. They said his present house may have caused part of his illness. It won't be right for us to come out again and start asking for money after his treatment. Nobody is trying to deceive or dupe members of the public. Just take your time to come and visit him at home for you to see what I mean,” she said.